Advantages... The primary advantage of a DCT is that it provides the same driving characteristics of a manual transmission; that is, a quicker throttle response and no drop in engine speed when the driver lifts off the accelerator. All with the convenience of an automatic. Disdvantages... The main limitation of a DCT is the same as all geared transmissions. There are a fixed number of gears and the transmission cannot always keep the engine at its optimal speed for maximum power or maximum fuel economy. Most people know that there are two basic transmission types, manuals (where the driver uses a clutch pedal and changes gears using a stick shift) and automatics (which do all the work for the driver). However, there is also something in between that offers the best of both worlds - the Dual Clutch transmission. 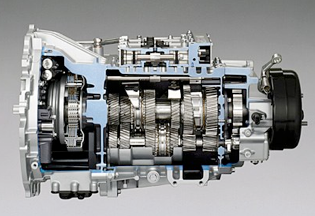 The dual-clutch transmission, (as the name suggests) uses two clutches. 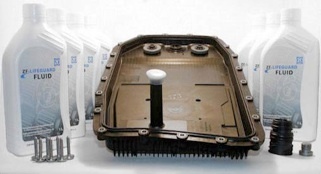 These clutches are controlled by an array of sophisticated electronics and hydraulics and behave just as the do in a standard automatic transmission. 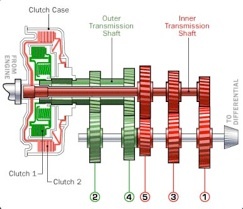 However in a DCT these two clutches operate independently from one another. One controlling the odd gears (first, third, fifth and reverse) and the other controlling the even gears (second, fourth and sixth). Using this arrangement means that gears can be changed without interrupting the power flow to the engine. Ideal for high mileage vehicles, towing vehicles and vehicles damaged by speed bumps.